This post is also authored by Kiran Madnani, Principal PM Manager, Azure Infrastructure Management and Snehith Muvva, Program Manager II, Azure Infrastructure Management. 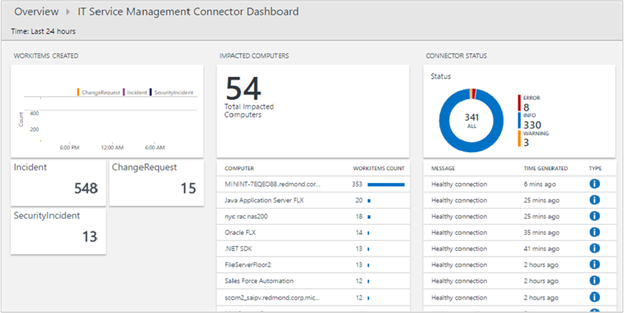 We are happy to announce that the IT Service Management Connector (ITSMC) for Azure is now generally available. ITSMC provides bi-directional integration between Azure monitoring tools and your ITSM tools – ServiceNow, Provance, Cherwell, and System Center Service Manager. Pull the Incident and Change Request data from ITSM tools into Azure Log Analytics. You can setup ITSMC by following the steps in our documentation. 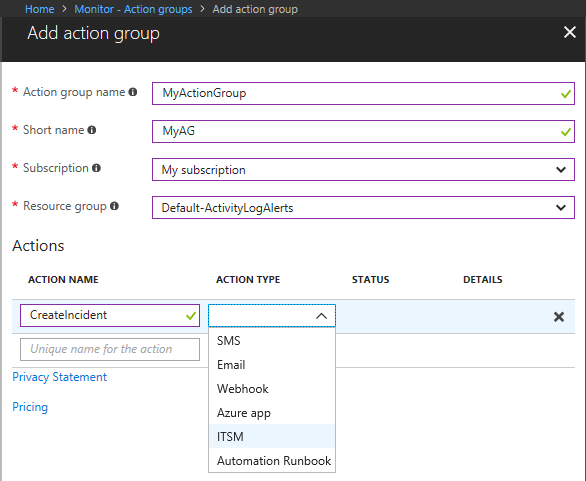 Once set up, you can send Azure alerts to ITSM tool using the ITSM action in Action groups. You can also view your incident and change request data in Log Analytics to perform trend analysis or correlate it against operational data. To learn about the pricing, visit our pricing page. We are excited to launch ITSM connector and look forward to your feedback.